Pastor Appreciation Month prompts pastor appreciation ideas to honor pastors. While Pastor Appreciation Month is an annual event when congregations implement creative pastor appreciation ideas to honor pastors, it is much more than annually paying tribute to pastors. Although we think of Clergy Appreciation Month as a calendar event, often in October for many congregations, when they purposefully honor pastors and pastoral families. Let's do more than just focus on one month of the year. 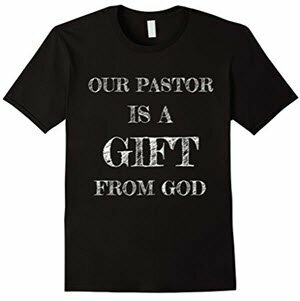 Wearing the shirt below could express how your church family feels about your pastor! While the Pastor Appreciation Celebrations are typically scheduled in October, as a calendar event it can be held at any time that is convenient for the church and the community. Take a moment to think about those two words -- pastor and appreciation. One of the best pastor appreciation ideas you can implement is to view pastor appreciation as an ongoing, day by day, attribute of a healthy, loving congregation. In other words, to express appreciation and affirmation of your spiritual leaders is appropriate throughout the entire year simply because appreciation is what a loving congregation does. As Pastor Appreciation Champion for your church, you set the tone for expressing gratitude to your spiritual shepherd. Look at that privilege from a wider perspective than a month on the calendar. Every church I have pastored wanted to be known as a loving church. Simplistic I am sure, but I believe that one of the most obvious measures of a loving congregation is this: How they treat their pastor. Like it or not, every church has a reputation within its community. Every church is known for something, sometimes positive, sometimes negative. Just saying your church is a loving, friendly church doesn't make it so. I really do believe that the most obvious indications to your community that your church really is a loving fellowship is how you love your pastor and show appreciation to those in pastoral leadership. So if you want to be a loving church congregation, focus on showing appreciation for those who are called to shepherd the flock. Honoring your pastor should be done for more reasons than just saying thanks for the hard work these committed spiritual caregivers provide in their role as spiritual shepherd of the flock. Hopefully Pastor Appreciation Month will prompt your church to honor your pastor with exciting, creative pastor appreciation ideas. May it also be a demonstration of God's love for each of us, thereby becoming a powerful tool of evangelism.